If you were looking for a tofu recipe that you can serve along side potatoes and veg, then this my friends is it. A good ‘ol vegan meat and potatoes type dish. Serve this with a little of your favourite BBQ sauce for dipping, and have yourself one mighty fine meal. This recipe makes two large tofu steaks, but you can cut the tofu into smaller pieces if you like, or feel free to double the recipe as needed. 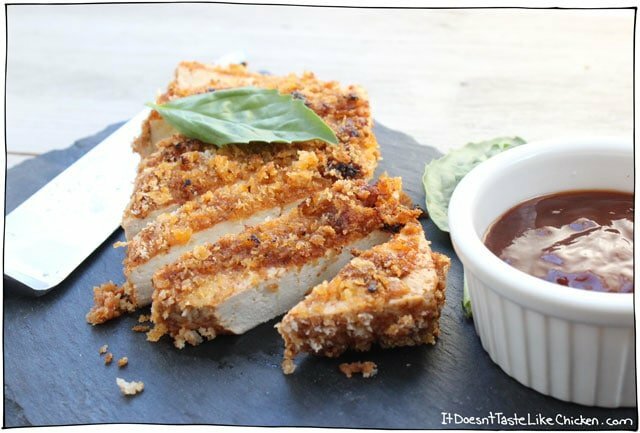 To make some of this Crispy Breaded Tofu Steak gloriousness, we first need to press the tofu. I’m often looking for ways to skip this step in recipes because, let’s face it, I’m a pretty impatient person, but it’s important for this recipe to make the steaks a bit more chewy, and not so watery. Slice the tofu into steaks, I like to slice the tofu lengthwise into two large steaks, but you can slice it however you like. To press the tofu, if you don’t have a fancy schmancy tofu press (and I don’t), lay the tofu pieces on a clean dishtowel and then wrap them all up in the towel. 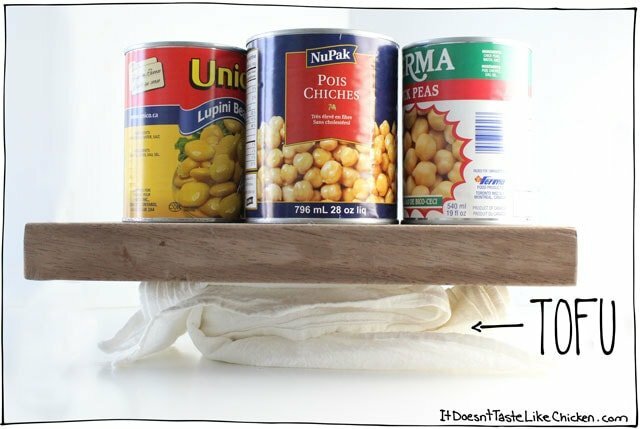 Put a cutting board on top, and balance something heavy, such as a few cans on top of that. You just made yourself a tofu press! Let the tofu press for 10 to 30 minutes, the longer you press it, the drier and more firm the steaks will be. 10 Minutes will yield a moist soft tofu, 30 minutes will be drier and chewy. The decision (and patience) is up to you! When you are ready to make your tofu steaks, mince the garlic cloves then add that to a large flat bowl that is big enough to fit one of your tofu steaks. Add the remaining sauce ingredients to the garlic bowl: the tomato paste, dijon mustard, maple syrup, soy sauce, water, and pepper, and mix together. In a separate dish add the breadcrumbs. Dip the tofu steaks in the tomato paste mixture, and use a spoon or fork to help spread a thick layer of the sauce on the tofu. 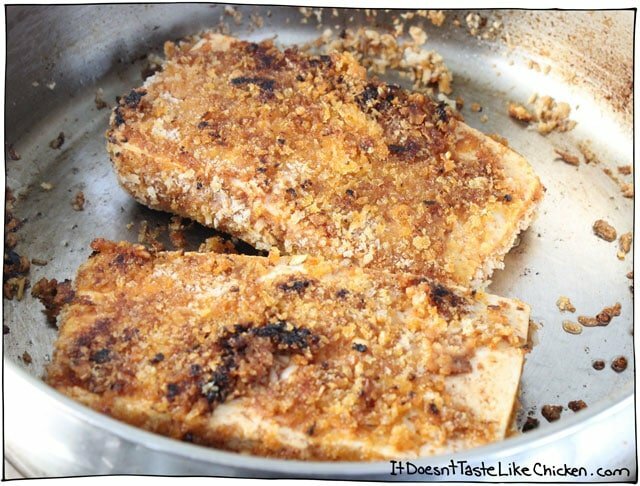 Now dip the sauced tofu steak into the breadcrumbs and use your hands to help pat the breadcrumbs onto the tofu. Repeat with remaining tofu pieces. Heat the oil in a frying pan over medium heat. When hot, carefully fry the tofu steaks until they are golden brown on both sides and heated through. About 3 to 6 minutes per side. The breading can be a little fragile and falls off easily, so I found the best technique was to use a large spatula (and not tongs) for flipping. Just be gentle when handling the tofu. For presentation, cut the tofu on an angle (cause it looks all pretty and stuff) and serve with a side of your favourite BBQ sauce for dipping. 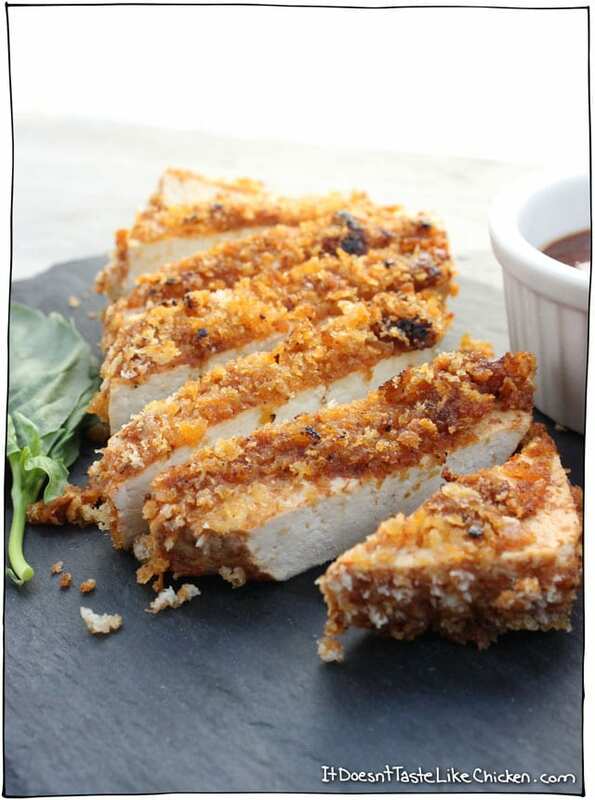 Moist and tender tofu, zingy tomato marinade, with a crispy breadcrumb coating. A quick and easy recipe that is perfect for serving with potatoes and veg. Gluten free option. Drain the tofu, and cut into your steak sized pieces. I like cutting it into two large steaks by slicing the block it in half lengthwise, but you could cut it into more pieces for smaller crispier tofu. Once cut, lay the tofu pieces on a clean dishtowel, and then wrap them up in the towel. Put a cutting board on top, and balance something heavy, such as a few cans on top of that. This is how you press the tofu to help release excess water. Let the tofu press for 10 to 30 minutes, the longer you press it, the drier and more firm the steaks will be. When you are ready to make your tofu steaks, mince the garlic cloves and add them to a large flat bowl that is big enough to fit one of your tofu steaks. In a separate dish that is also big enough to fit the tofu steak, add the breadcrumbs. Dip the tofu steaks in the tomato paste mixture, and use a spoon or fork to help spread a thick layer of the sauce on the tofu. 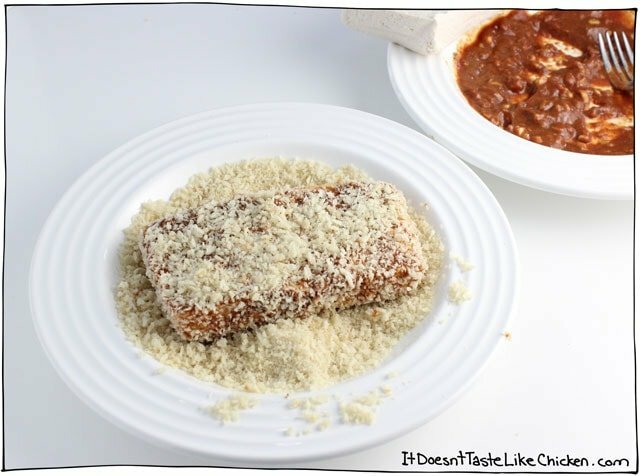 Now dip the sauced tofu steak into the breadcrumbs and use your hand to help pat the breadcrumbs onto the tofu. Repeat with remaining tofu pieces. Heat the oil in a frying pan over medium heat. When hot, carefully fry the tofu pieces until they are golden brown on both sides, and heated through. About 3 to 6 minutes per side. The breading can be a little fragile and falls off easily, so I found the best technique was to use a large spatula (and not tongs) for flipping. Just be gentle when handling the tofu. 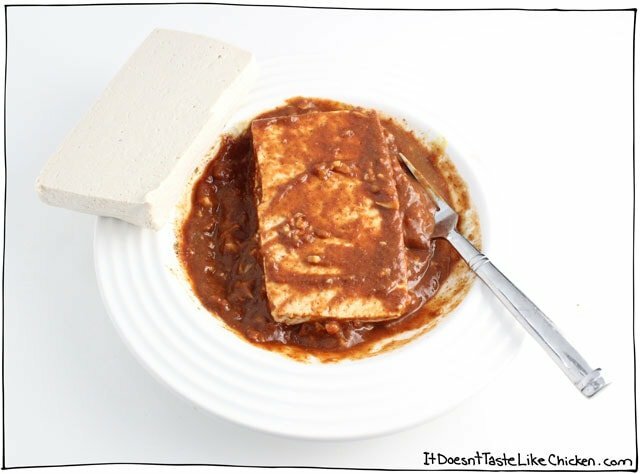 For presentation, cut the tofu on an angle and serve with a side of your favourite BBQ sauce. *You can use any type of breadcrumb for this recipe. I like to use Panko (Japanese breadcrumbs), which will make it extra crispy, but rice breadcrumbs work well if you are gluten free. Different breadcrumbs will vary the texture of the crust. I love the flavor of the sauce–dripping in umami! Unfortunately, my breading fell off rather easily even though I flipped the steaks with a spatula. Any tips? So happy you enjoyed, James! You just have to be very careful when breading and flipping the tofu. Enjoy! Follow-up to my last attempt: I made the recipe again with a few changes: I used honey instead of maple syrup and I coated the tofu in corn starch before coating it in the sauce. Cooking it more slowly and gently flipping it with tongs allowed the majority of breading to stay intact. Thanks for the recipe–this is a new favorite! Hi Amanda, These would probably get a little dry if baked instead of fried, but you could try 400F for about 20 minutes. Enjoy! I am pretty new to being vegan but your website has really helped me. Whenever I need tot make something for dinner I immediately go and browse your recipes. I decided to try this tofu recipe. It didn’t turn out has expected but still very tasty. My tofu was way too crumbly and wouldn’t stay a solid shape. Do you have any suggestions how to prevent this? I still managed to get a couple small nugget-sized tofu steaks and for the crumbly bits at the end I mixed with the leftover sauce and panko crumbs an made a ball shape and cooked. They turned out to be a really good vegan meatball. I will be trying to make this again though since the outcome was still very good and delicious. I even got my brother (who usually frowns upon my vegan foods) to ask for some! Hi Anaia, did you use extra-firm tofu? frim or medium tofu easily crumbles. If yours was extra-firm, I recommend trying another brand as extra-firm tofu is really rather sturdy usually. Another awesome recipe!! I agree it was hard to flip with the coating. But still came out great. So far it is 2/2 on my attempts at your recipes. Definitely my new favorite site! Thanks Sam!! Do you think I could make them in an air fryer? Would it be possible to turn this into nugget sized? I just made this and wow! It is so good! My second time with tofu. The first time was horrible! This recipe is so good! Thank you so much….I am trying to go more plant based proteins. I roasted some carrots and zucchini with it…yum! Hi Sam, this is the third tofu recipe that I try from your blog — LOVED all of them. I used to hate tofu, but now I think I might be addicted?? Oh well. I feel like I might have done something wrong in this one, because it didn’t turn out as good as the previous ones. However, the tomato paste mixture was so delicious that I caught myself licking the remains in the bowl and wishing there was more to use in something else. Do you have any ideas on what other sorts of dishes could I use this mixture? I’m curious what makes the fat so high? How much lower is it if you use a fat free non stick spray instead of olive oil? It would be the olive oil but also tofu is usually pretty high in fat as well. It was a lot better than I thought it would be and I ate it but I don’t think I’ll be making it again. I have never liked tofu but I was hoping this would win me over. Haha, this is definitely a recipe for people who like tofu! You are amazing. This is one of the best things I’ve ever eaten. This is probably the 5th recipe I’ve made from your site. My husband and toddler paused from eating long enough to say how good it was. And continued to devour and ask for more. You have made be coming vegan exciting and fun and easy! But the taste wasn’t so good:( my tofu never work out if I don’t leave it in the sauce longer. Aww sorry you didn’t enjoy it. I see I’m a little late to this tofu party But I only JUST realized how much I loved it a couple weeks ago!! I showed my husband the picture of your tofu steak and he didn’t believe it was a vegan meal until I made it and proved him wrong! This is delicious and I can’t stop eating it. I can’t wait to try the rest of your tofu recipes as I’ve tried many of your others and love, love, LOVE THEM! Yum! This was so delicious I could hardly stop eating it. Totally Yum or as I would say Yotally Tum. Mom made this for dinner and it was absolutely great. Yah Sam. Fortunately, I do have some left over for tonight. I was craving some vegan BBQ and these steaks hit the spot! Served them with pseudo-vegan Caesar salad with roasted potatoes. Very yummy! Thank you so much. isnt mustard made with eggs? and since the recipe has dijon mustard..
Nope, I think you may be thinking of mayonnaise perhaps? Mustard isn’t usually made with eggs. The dijon mustard I have in my fridge right now contains vinegar, water, mustard seed, salt, chardonnay wine, citric acid, tartaric acid, spices, and tumeric. All vegan 🙂 You can always just check the ingredients on your mustard to be sure. Enjoy! Wow! Another winner. These were outstanding. I cut my block into fourths so that I would have more of that crunchy goodness with each piece of tofu. Side of simple steamed broccoli, horseradish mashed potatoes, what more could you want?? Cut up into eighths, they would make super hot wings for Super Bowl Sunday. I was lazy and just took some ketchup, Siracha sauce, molasses, smoked paprika, basil for a quick dippy sauce. Sam, you really are talented. Making these bad boys again. the boyfriend is addicted! YUM! I had some tofu sitting around and wanted to make “steaks” as it would be quick and easy. This really couldn’t have been any easier. I marinated them for about thirty minutes and then put one of the steaks in the fridge for the next day. Fried the other steak and topped it with a blend of Hoison sauce and Sriracha. Try it, it’s amazing. I used ~1tbs of Hoison and 1-2 tsp of Sriracha. The added spice was just what these steaks needed. I could eat this every day, thank you! So happy you loved the recipe, Anna! I love hoisin and sriracha as well. Great idea! Hi I made this but ate it it. Before pictures try chilling after breading flawless crust. I agree about the chilling. There were very few crumbs left in the skillet. OMG! This was soooo good. I halved the sauce ingredients and just used some left over tofu I had, and it was amazing. Will be making many times again for sure. Thank you! I just made these and I love the flavor! Very addictive I must say! Currently debating on eating the whole thing. I found that heating it low it keeps the crumbs from burning and I ate it wrapped in a tortilla with BBQ sauce made vegan cashew ranch mixed with it! So yummy, What can I say, it’s the Mexican in me! I was hoping I could find a comment where someone made wraps with it. That’s what I’m trying this week. We’ll add shredded lettuce, diced tomatoes, diced red onion, and Just Ranch. Fingers crossed! I made this recipe yesterday and it was DELISH! I didn’t have breadcrumbs and used Matzo mix (I use it in place of breadcrumbs for other things). I really needed to use breadcrumbs. Next time I will. I also don’t thinking buying a tofu press is necessary. I place the tofu between two cutting boards and then place several heavy books on top. Always works! Made this tonight. I added salt, pepper and ras-el-hanout to the mixture the tofu is dipped in. All good additions. I used dry roasted garlic instead of fresh garlic and just a tad. The dish was excellent. The bbq sauce added zest but didn’t really work. I think next time I might just make extra tomato paste mixture to serve on the side I let the dipped tofu sit for about 20 minutes before dipping in the panko crumbs and cooking. The crumbs stayed on well. This will be in my regular rotation! This looks delicious and I cannot wait to try!!! 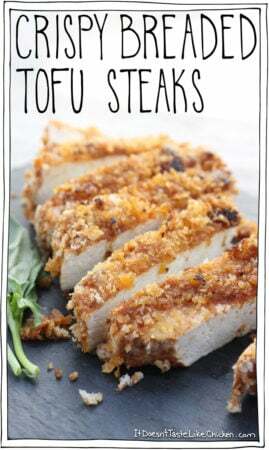 I’ve been looking for a tofu steak recipe such as this. Not sure if you know that or not but that’s the last thing a vegan wants to see after looking at a delicious tofu recipe for sureeee. I have animal product ads blocked, but unfortunately they sometimes slip through. Everyone sees different ads based on their location and search history, so I can’t always catch them. If you see an offending ad like this again, just email me the link the ad takes you to and I can have it blocked. I hope you enjoy the tofu! 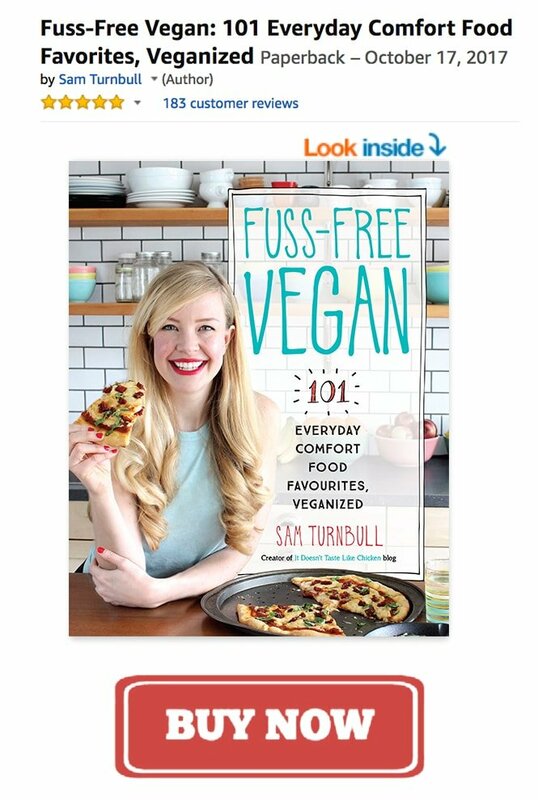 Hi Sam, I am not a vegan and I have never had tofu before but I had to comment because this recipe looks absolutely amazing!! I think I would have eaten this entire thing in one sitting if it were in front of me 🙂 You are definitely very talented! Yum! Fellow glutton here ready to eat a block of tofu ha ha. I work out, too, thank goodness because if I didn’t … hello elephant pants! Can’t wait to try! Hahaha! The combo of being vegan and working out works wonders for me. Haha. Tofu for the world!!! I’ve been buying sprouted tofu lately to make my tofu scramble, it seems to be much “drier” than other tofus and I don’t feel like I need to press it first to get a solid texture.. Maybe something for you to try! This looks delish! Made these super simple and super delicious Tofu Steaks for dinner. Huge hit at this house! Best is, Toddler approved. The 2 1/2 year old girl LOVED these. Also, we found that with the delicious tomatoey/breadcrumb coating, there was actually no need or desire for BBQ sauce (and I LOVE any reason to pull out the BBQ sauce!). As for frying, yes, the breading is delicate; definitely using a thin metal flipper helped, and NOT crowding the pan. Thanks Sam. Wow! This was brilliant. I’m glad my will power told me only to make half the recipe, because I would have eaten it all. Thanks for such a quick, easy, and delectable recipe. I’m already looking forward to making it again. Can’t wait for your cook book. Thanks again. Yay!! So happy you loved it so much Elizabeth. Yeah, now you understand how I managed to polish off the whole thing. Hahah! I made this immediately after reading… Thank you for sharing!! I made a few tweaks to it, hope you don’t mind!! I added fresh ginger to the sauce also added fresh herbs (flat leaf parsley & cilantro) and chopped a dried red chili to the panko crumbs. Total yum!! These look like the real deal!! Drooling. I eat tofu pretty often so next up on my things to buy: a fancy tofu press! Ooooh let me know how you like it! I was thinking of doing a post comparing/reviewing different tofu presses…but that would mean I would have to buy them all! I always want to know which one is the best. Haha. This looks great, however, I’ll probably bake it as I am “Frying Food Challenged”. I don’t know why, it’s just true and I’m tired of ruining good food. Haha! Bake away!! I haven’t baked it yet myself, so if you do let us know how it turns out for you. I think a freezing tofu post is in order! Freezing gives it a firmer texture. I always freeze my tofu if I’m going to make bacon. I think I might try baking, too. This looks so good! I love the idea of the tomato mixture dip with the crumbs. I wonder if it would work as well if it were baked instead of fried. Beautiful presentation. My favorite tool for pressing tofu is using the TofuXpress. This woman has a hidden camera that sees directly into my fridge. Honestly, I was just going to bake a potato and have it with a plate of rapini for lunch, Well, scrap that idea. It’s tofu steaks now. And then a nap. Thanks, Sam! Hmmmmm! This looks tasty! I may have to try this over the weekend. Sidenote-I’ve heard that pressing then freezing and re-pressing gives a good texture. In your opinion is the freezing necessary? Freezing tofu provides a totally different texture. It’s definitely not necessary, it’s just to achieve a different texture. freezing gives it a spongey texture. Some people love it, some don’t. Hmmm that’s a great idea for a post! Maybe I will show you how to freeze and press tofu, and what it’s like when you do that. I was just going to post that I used frozen tofu for this recipe and it was amazing (we put the strips into tacos!) but then I saw this. I freeze all of my tofu because the texture is quite different. Freezing soft tofu is my new favourite thing as the tofu can be pulled apart into shreds.